There are spacious, aesthetically designed & well-maintained playgrounds suitable for all kind of sports facilities. 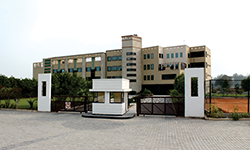 The school boasts of well-equipped Science lab, Mathematics Lab, Language Lab and State-of-the-art Computer Lab. The Library (Resource Centre) has a large number of carefully chosen books, reference books & encyclopedias. It also offers large pool of audio and video resources.